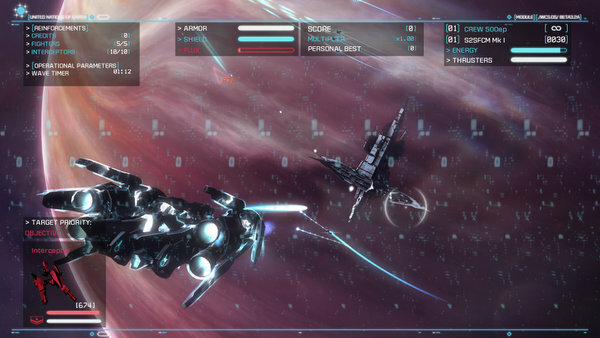 Strike Suit Infinity is the score chaser based on Born Ready Games’ space shooter Strike Suit Zero. 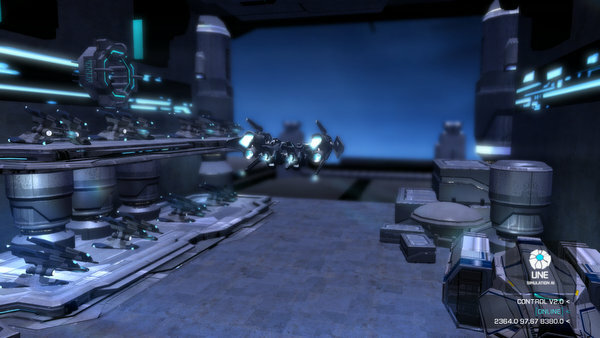 Players can get into the pilot seat of one of three Strike Suits and battle against endless waves of enemies. Strike Suit Infinity has no story. You will have to use your own imagination to explain the endless waves of enemies. Strike Suit Infinity shares the same mechanics as its slightly older brother, Strike Suit Zero. Players take control of a Strike Suit that normally looks like a fighter plane. As the game progresses and enemies are destroyed, the player acquires more Flux. The Strike Suit can transform into a humanoid mech that is able to fire off barrages of missiles and powerful short ranged guns. Firing the weapons as a mech costs Flux but the damage dealt in mech mode is far greater than the normal flight mode. The game hurls round after round of enemies, each round containing several waves of enemies. 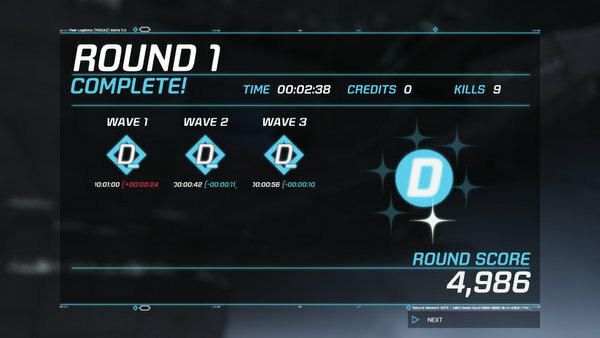 There are eighteen rounds in Strike Suit Infinity, with the 18th round being an infinite round. Between rounds, a menu display pops up showing the player’s current upgrades, the enemy composition of the next round, and options to hire allies for the upcoming round. Ally pilot level upgrades only last for the duration of the game. 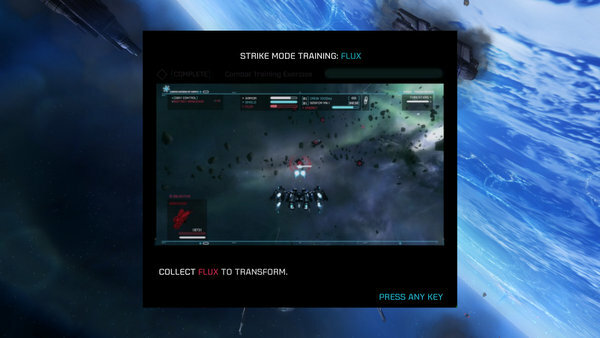 To earn new Strike Suits, weapons, and upgrades players will need to rush enemy transports as they spawn and destroy them before they disappear. The game does not make this very clear that this is how upgrades are unlocked, leaving me perplexed for quite some time on how I was randomly acquiring these permanent upgrades. The announcer will inform the player of the incoming transport and recommend that players destroy it for upgrades. With the chaos of an intense dog fight, I actually missed the announcement for several rounds before I actually noticed it. I would have preferred to see a text prompt with this information when the cut scene introducing the transport played. As a score chaser, Strike Suit Infinity is solid. The action is well paced and can be fiendishly difficult. Coming from an Ace Combat background, I was quickly forced to break out of the habit of zooming around in flight mode slowly whittling down the opposition. Using Strike Suit mode is a quick way to build combos which are the key to high scores and extra credits. Managing the risk and reward of spending credits on allies and their skill levels also turned into a key aspect of the game. A good score chaser should test the skill of the player. Strike Suit Infinity delivers. Strike Suit Infinity can be played with a gamepad, joystick/keyboard, or mouse/keyboard combo. I tested the game with both the gamepad and the mouse and keyboard combinations. Although the gamepad controls were usable, I found that the game seemed to be better designed for the mouse and keyboard. I would have liked to see the option to invert the left thumbstick while leaving the right one untouched. Using the guns effectively in flight mode is an important part of clearing waves quickly. The gun’s crosshairs have a little bit of movement that is independent of the ships movement. When using the keyboard and mouse, the keyboard is inverted while the mouse maintains the traditional FPS movement. When using the gamepad, either both sticks are inverted or not. For me, I felt really awkward when transitioning from the mouse and keyboard controls to the gamepad. Strike Suit Infinity is an excellent looking game. Veteran mech designer Junji Okubo is behind the Strike Suits’ design. He has lent his imagination to several video games and anime, including Appleseed: Ex Machina and Steel Battalion. The Strike Suits transform back and forth smoothly and the flight modes look as realistic as possible. One minor annoyance is the fact the end of round animation is reused over and over again. Each round takes place in a slightly different area, but the end of round space station looks like it is located at the first level. Graphically, Strike Suit Infinity is looks solid. The game runs smoothly without any sudden drops in frame rate. The UI is futuristic and utilitarian. The cockpit view is a little disappointing as it lacks detail and takes up almost the whole bottom third of the screen. The sound effects in Strike Suit Infinity are excellent. Surround sound performs well, as I could easily pick up the direction of oncoming ships from the direction of their warp noises. Allied ships compliment your kills, providing a nice bit of radio chatter. The music unfortunately gets repetitive quickly. When the game picks up intensity, an anime styled song begins to play. It sounds like the same one-minute track played on loop unfortunate and quickly becomes boring. It would have been nice to have a little more variety in the music. For $6.99, you get what you pay for. Strike Suit Infinity provides intense dog fighting action against infinite waves. Unfortunately the game could use some more variety in the music and end of round animation departments. Additionally, I would like to see the gamepad controls tweaked. However, Strike Suit Infinity serves as an excellent chance for gamers to check out the Strike Suit series without plunking down the full price for Strike Suit Zero.